Chasing the Monsoon is loosely based on a novel that I read quite recently by Alexander Fraxter and conceptually it presents several opportunities to present India in a completely new light when the monsoon season commences across the country. Coinciding with the onset of the monsoons CEAT and MTV repeated the ‘Chase the Monsoon’ Supershow – which was a success last year. A social reality show in its second year, Season 2 featured a 24 day biking road trip with 4 teams, each consisting of two members with limited budgets to explore India during the monsoons. The aim of the show as last year was to garner visibility for an innovative show concept and engage an online audience also vying to embark on similar journeys sometime in their lifetime. The participants are cheered by online aspirants as they travel across India – covering the dry lands of Rann of Kutch to the damp terrains of Cherrapunji– the monsoon capital of India. The concept of engaging followers of the participants online was introduced last year and this year the objective was to make the engagement more enriching. This is being made possible through effective content using social interactions and fan generated content. Contestants engage with their followers, seeking support via Facebook, Twitter and Youtube. While doing so creatively, it earns them social currency which is linked to their team’s budget on the show. This is bound to get immense popularity amongst the the young audience. CEAT who is looking to target youth for their bike tyres are in a complete win win situation. Offline, the riders discovered various terrains and seasons across India. Online, it garners more attention from both the digital savvy adventure junkies and the bikers segment. Visibility across MTV fans using their social network base and engagement was also garnered during this period. The process of sending in entries has been digitalized. Contestants registered as a team of 2 for the series by submitting videos, blogs and pictures describing the biking escapades of their life. Once shortlisted, the teams gathered votes from friends and families to get selected for the ‘Chase the Monsoon 2’ expedition. Through the journey and the tasks, the teams score points which at the end of 24 days are accumulated and the team with the maximum points wins the ultimate biking gear. The teams have to create amazing photos and videos, push them out to friends online with their respective hashtags (eg. #chaseblizzards, #chasecyclones, #chasehurricanes & #chasetyphoons). The team’s job is to make sure that their content reaches as many people as possible. The team with the most amount of social appreciation wins the show. Additionally, the teams which score highest points daily will receive a better budget for the next day as compared to the other teams. The microsite stores all the relevant content, information and updates about the show. Associating with MTV was a great decision for an activity like this, considering the target audience and the fan following that MTV has. The campaign already received additional 25% team entries and there was a 16% organic growth in the Facebook fan base since August 8, 2014. Probably due to the popularity of this exercise last year. Since the entire process was digital, the gradual increase in the social media volume built up since the call for entries was through gathering votes to get selected by friends and family. When the supershow took place, not only was it televised on MTV’s website and channel, there was equal enthusiasm in the digital space, making the entire socio-reality show quite seamless across platforms and media. 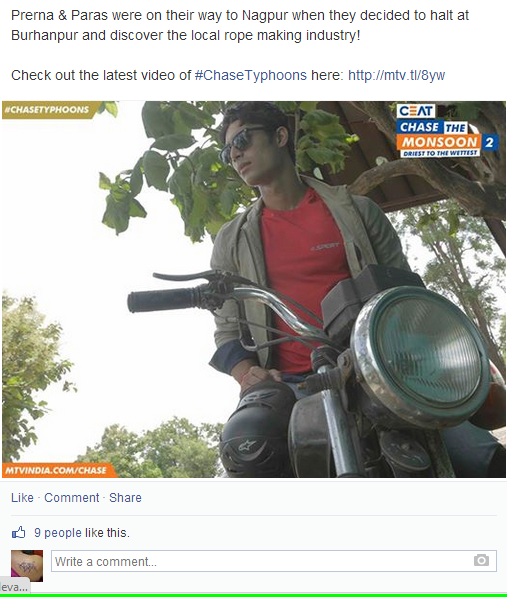 Sections of the chase were also promoted by Sonata Adventurer on MTV’s fan pages. This was another interesting way to keep the online viewer engaged. The concept of making each team focus on a particular theme – cuisine, nature, heritage and culture was another interesting twist to the chase. This engaged audiences online with different interests. Bikes and road trips are usually considered a man’s thing to do. The ‘only female’ contestants also widened the net of online audiences to females. This was a very clever move by the brand, since a lot of users of social media are women. The social currency format of the show itself is creating quiet a buzz on every platform. This is one of the Contestants video on Youtube channel #ChaseCyclones. The whole show is way more rich in terms of content when compared to the last edition. CEAT has understood the importance of the associating with the right brand. It has also asserted its importance of web realities fuelled by social interactions and fan- generated content. The themed content of the show is a step forward to make the audiences with various topics of interest in wildlife, heritage, cuisine and culture interested in the show. Making the content richer and more engaging is the only way up for a socio-reality show like this. 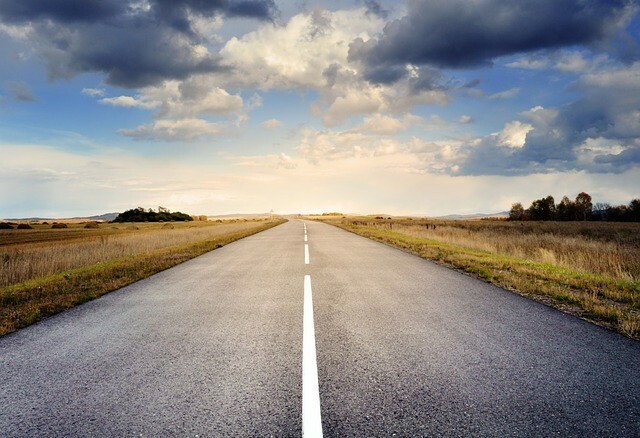 This is one engaging and fruitful campaign that marries the online and offline worlds seamlessly and has been replicated by several automobile companies in various formats. Considering several brands have understood the power of the web and have been engaging customers in very innovative ways, it is left to be seen if Chase the Monsoon Season 2 has what it takes to make an impact in award functions.